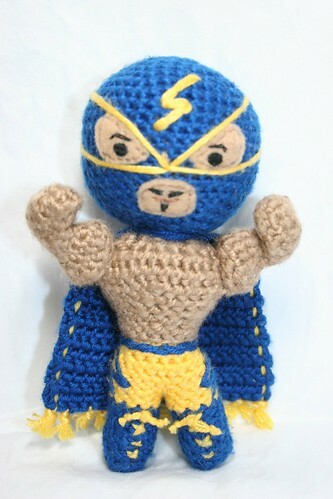 El Rayo Azul with his *new and improved* face, originally uploaded by *mia*. This guy’s face was bugging me, and I was so happy with my panzon’s face that I wanted a similar one, though unique to the personality I envision him having- you know, a bit of a preener, a bit of a strutter, but kind and strong nevertheless. 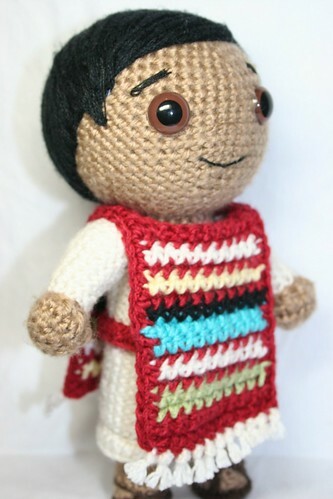 sarape!, originally uploaded by *mia*. He’s someone else that I’ve been working on for a while off an on. I was frustrated because I’ve attempted a sombrero at least 5 times and constantly been dissatisfied with the way it’s turning out. I may just have to throw in the towel and call it a day on him, I do like how the rest of him turned out. I’m still not 100% with the way his mouth is right now, but I don’t know if it would be better in a different color? 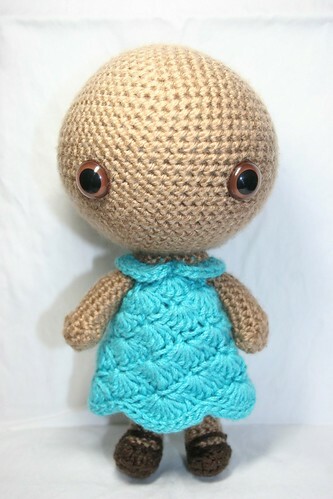 Selah doll 2.0 wip, originally uploaded by *mia*. I’ve been trying to finish her up for a while too, I don’t know what the heck I was thinking starting up on all of these different ideas. Most of the time I can rein myself in and just write the idea down and then work my tail off to get my wip done, but I’ve sort of ended up muddling myself by not finishing even one of them. 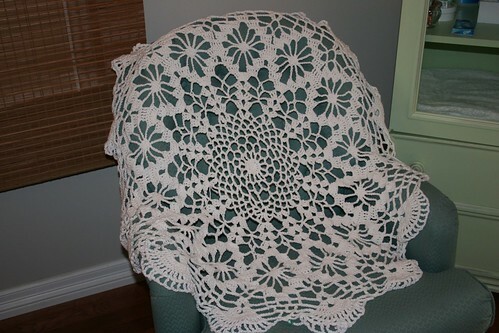 doily blanket over the chair- 2 rounds to go ’til it’s finished!, originally uploaded by *mia*. Okay, my last wip for now, and I know everyone whose ever done a doily can probably immediately spot mistakes, but this was my first one ever so I’m being forgiving on myself and sharing it. I think I might like making doilies, I don’t know if I want to make them the way they’re intended or into baby blankets like this one, but I like the repetition and mind wandering qualities they inspire. I’m still not done with it either, there’s only 2 rounds to go, but we got back from a weekend with my aunt where I ran out of yarn and Monday we were called out to Iowa. DH’s uncle passed rather unexpectedly and we were needed out there for the week. I’m still not finished unpacking and doing housekeeping stuff, but I needed some time to spend on my type of stuff. Anyway, hopefully even more things will be finished the next time I post.